A rich, powerful acoustic voice with improved electronics. 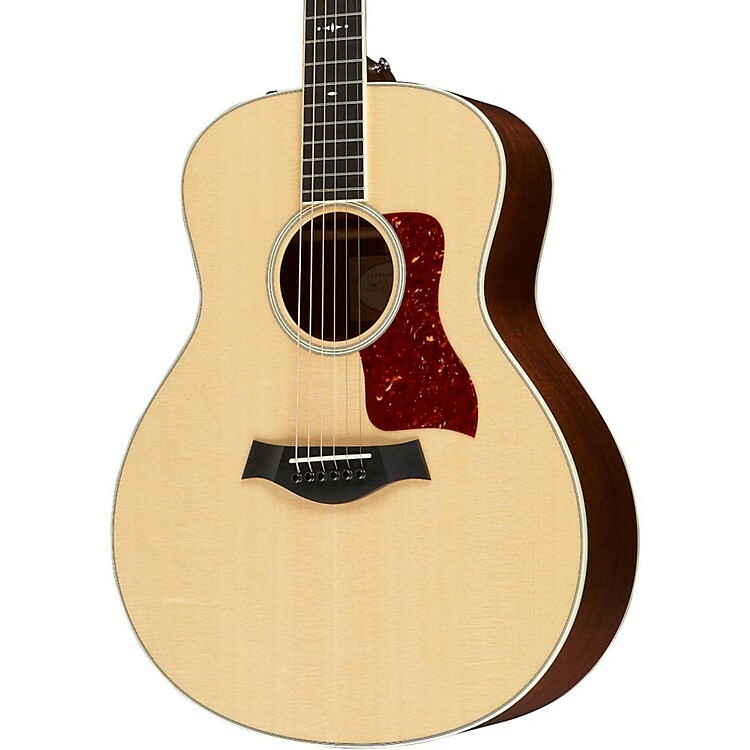 Mahogany's meaty midrange and fundamental focus take on another level of boldness and depth, especially in the lower midrange, with the spruce-top Grand Symphony 516e. Taylor's onboard Expression System 2 pickup will capture all your tonal nuances and cut through a mix in an amplified setting. The neo-vintage appointment package includes an ivoroid rosette, ivoroid binding, and a Century fretboard inlay. Includes case. Body Length: 20" / Body Width: 16-1/4" / Body Depth: 4-5/8"
The Grand Symphony shape joined the line in 2006 and delivers a rich, powerful acoustic voice. Think of it as a Grand Auditorium with a turbo boost, thanks to expanded physical dimensions, including a slightly wider waist and a bigger lower bout. Strummers and pickers with a driving attack will love the fullness, volume and sustain. Yet for such a robust voice, the GS is also clear and responsive to fast picking runs or a light fingerstyle touch, so if you're a dynamic player, this shape is a true contender. And the big voice doesn't come at the expense of balance. The piano-like bass, meaty midrange, and thick, shimmering highs blend seamlessly. These traits also make the GS a great vehicle for 12-strings. If you like a lush, potent guitar tone that has the horsepower to compete with other acoustic cannons out there, the GS shape is a worthy choice. The Taylor Expression System 2 (ES2) is a revolutionary pickup design that delivers the latest in Taylor's ongoing innovation in acoustic guitar amplification. The heart of the Expression System 2 is Taylor's proprietary behind-the-saddle pickup (patent pending), which features three uniquely positioned and individually calibrated pickup sensors. The location of the sensors enables a more dynamic range of acoustic sound to be captured than ever before. Together with Taylor's custom-designed "professional audio"-grade preamp, this system produces exceptional amplified tone and responsiveness. On stage through a PA, plugged into your favorite acoustic amplifier, or direct into recording software, the Expression System 2 faithfully conveys the voice of your Taylor guitar. For decades, piezo-electric transducers have been positioned under the saddle of a guitar based on the long-held belief that the string and top vibration cause the saddle to "bounce" up and down. But Taylor's electronics team, led by developer David Hosler, discovered that the vertical movement is actually heavily restricted, and that the saddle gets "locked down" due to the string tension's downward pressure. That's why a traditional under-saddle pickup with piezo-electric crystals often responds with a sound characterized as thin, brittle, brash or synthetic, especially with more aggressive playing. The saddle's natural range of movement as the guitar is being played is actually back and forth like a pendulum. That revelation led Taylor's design team to relocate the crystals from under the saddle to behind it. The new positioning enables the crystals to respond more naturally to the guitar's energy as it is transferred through the saddle. Three pickup sensors are installed behind the saddle, through the bridge, with three tiny Allen screws that calibrate the position of the sensors in relation to the saddle. Enjoy improved Taylor tone with ES2 electronics. Order today.